The Jolly Postman is out on Christmas Eve making deliveries to a series of Fairy Tale characters: Baby Bear receives a Christmas card, Miss R.R. Hood gets a game from Mr Wolf and there are a few more surprises – I don’t want to give it all away! What I love about this book is these items are all made and put into envelopes in the book which you can pull out and look at – you can get so involved in this book! 1. You can just read and enjoy OR you could do several weeks of learning activities based on this book. 2. This book appeals to a range of ages. Young children can just enjoy the story and the older children might ‘get’ the inferences and jokes. But…… I’m a bit conservative when it comes to what I would read to children and there is one section that I probably wouldn’t read out loud. It’s the punch line to the Baby Bear’s Christmas Card (the words ‘shut up’ and ‘soft’ are used). It might bother some people, it might not bother others. But I certainly would not dismiss the book based on this very small part. What would I do? I might change it to ‘be quiet’ and ‘silly’ and not make much of an issue about it. Or I would cover the speech bubble and get the child/class to come up with their own answers. There is also a small warning on the back of the book about choking hazards due to the small parts in the book so take all necessary precautions and supervision. 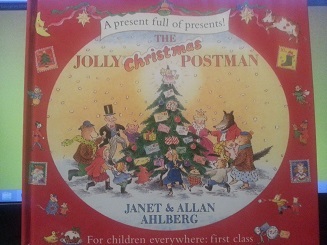 The Jolly Postman really is a lovely book to enjoy reading over and over again!